Inside, we collect integrator comments that explain these issues, how it impacts them, and what they do to handle this. 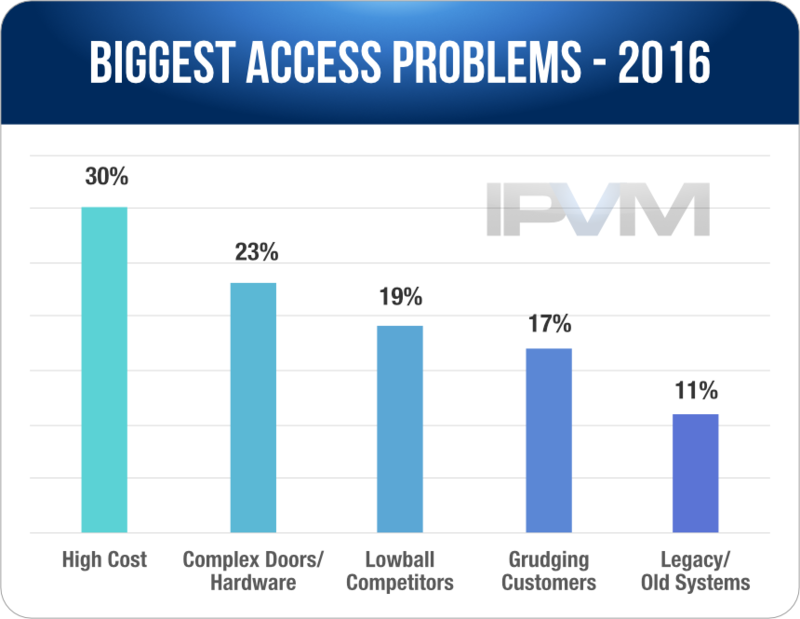 "What is the biggest problem you face with selling/servicing electronic access systems? Why?" This allowed open-ended responses rather than limit them to multiple choice preset options. As a result, they shared a large volume of feedback with us, which we've condensed into commonly themed groups. Integrator comments provide color to the key findings we examine below. ******, ** ******* ********** comments **** ******* ***** issues, *** ** ******* them, *** **** **** do ** ****** ****. "**** ** *** ******* problem *** **** **** selling/servicing ********** ****** *******? Why?" **** ******* ****-***** ********* rather **** ***** **** to ******** ****** ****** options. ** * ******, they ****** * ***** volume ** ******** **** us, ***** **'** ********* into ******** ****** ******. Integrator ******** ******* ***** to *** *** ******** we ******* *****. ** *******, *** **** cost ** ****** ********* is *** *** *******, mentioned ** **% ** responses. *** ******* ******* nature ** *****, **** hardware, *** *** **** to ****** ********* ***** like ********** ** ****** with **%. ******** *** *** *** five **** '******* ***********' that ******** **** ** steeply ******** *** ************ (19%), '********', ********* ********* do *** **** ** spend ******** **** **** the ******* *** *** disinterested ** ******** ****** basics (**%), *** **** Legacy ******* *** ********* ones ** ********, **** parts ***, ** ** get ************ **** *******. **** **% ** ***** votes, *** ******* ******** cited ** *** ***** of *********** * ****. "******* - *** ***** to ****** ******** ** is ****." "****** ******* ** ***** very ********* *** **** times ** ** * challenge ** **** **. from ********* ***********, ****** can **** **** * camera ***** **** *** a *** ** *** but ***** ***-******* **** affects ***** ******** ********** we **** ** ******* much ******." "*****. ***** *******. **** are *** ****** ** apples"
"******* ** *** ******* problem, ****** **** ** have **** ******* ****** control, *** *** * mismatch ** *** ***** of ***** *********** ** pay *** ****." "*****. **** ******* ** not ********** *** ********* elements ** ** ****** Control ******." "**** ** ******* *** biggest *********. **** ******* want ** ***** **** find *** **** ** involved." "***** - ********* **** no **** ** *** cost ********* ** *******." "*** ****-******* ******* (***-**-*** readers, ******* *****, ***)"
"*** ******* ******* ** "competition" **** ***** **** cheap ******** *** ******** software." "*** **** ********* **** China." "***** ******** ******** ** hard ** **** ******* when ********* ***'* **** differences." "******* **** **** ********, especially ** *** ************ market. **** ***** *** will ****** *** ***** using *** ******* ******** that ** ** **** quality *** ********* *********, then *** *********** **** come ** **** ******** strike ** ** **** at ***. **** *** understand **** ******* ******** and **** ** **** for * ********, *** will ***** ******** *** of *** **** *** to *********** *** ***** what ** ****." "********* ** ******** **** hardware. **** ***** ***** with *** ***** **** devices **** ** ***** with ** ******** *** vertical **** ******* ****** because ********* ********* ** not **** ** ******* panic ********..******** **** *** not ********* *** ********* do *** **** ********." "**** ******** **** *****. We *** ****** **% in-house, *** ************ **'** have ** ***** ** a *********, *** ***** also ** *** ** our ***********. **** ******** can ** * ***** pain." "*** **** ***** *****. Older ********* *** ** a ********* *** *******." "*** ******* ***** ** typically ******* * ********** quote ** ******* ********* work." "********* ******** *** ** thousands ** ****"
"********* *****. ***** *** some ***** ***** *** there. ** ******* **** to **** * ********* in ** ********* *****." "**** *** *** ******* in *** **** ******* up ***** ** *****." "**** ********** ******* ****** end ****** ******* **** we **** **** ** Software ***** *** ******* in ********** **** *** low **** ******, ******, and ********** **** ** see ***** ** *** area." "*******, ***** ***** ******* are ***** ******* ** smaller *********." "**** ** ************* ********* of ****** ********, **** consistently *** ****** ********* on ***** ******* **** look ******." "*** **** ***********, **** profit. **** ****** *******, price ****** - *** cards & ******* *** a ********* **** ** this *****." "***** ******* ******** ***** prices"
"*** ***** ** *** new ***-*** ******* ******** have *** ********* *** the ***-***** *** ***** opinion *** *** ***** of * ******." "******* ******* ** * lack ** ******** / education ** *** **** of *** ******** **** it ***** ** **** hardware, ********** ** * retrofit *********. ** ***** hardware ************* ** **** we ***, *** *** customers ***'* ***** **** topic ** **** ****** to *** ****** *********." "******* **** ***** ************* of ******** ******* *** long-term *********** *****, **** do *** ********** *** we ****** *** *** cheapest ****** ********* ** larger *********." "********* ** *** **** the **** ** ***** the ******** ** *** intimidated ** *** ********." "** **** *** **** opens, **** ** *****. [Customers ****] ** ******** In **** **********." "********* ******* * ****-**** reaction ** ******** ** an ******** ** * perceived ******, *** *** uneducated **** ******* ** technologies, **** *** ****, and **** *** ***** design ************** ** ******** access *******." "** *** ****** (****** east), *** ******* ******* is ******** *** ********* to *********** *** *** installed ******." "****** ***'* **** ** spend $*** ******* *** a ** ** *** smaller ****** ****. ********* they *** *** ******** price *** *** **** it ** *** *** these ***** ******** **** won't *** **% ** the ****." ******** *** *** *** 5 ******** ** *** prolonged *** ***** ********* support ** ******* **** are********** ******* ****** ******** ** ******** part *******, ***'* ********, or ****** ********* ** original *************. ******* *** systems ***** ** ********* not **** ******* **** sourcing ** ***********, *** also ******* ******* ******* also ******** '******* ***********' unfamiliar ************ ******* ** system *******. "****** ******* *** * nightmare. ****** **** ******* else's **** ** ****** a ********." "**** *******. *********** ********. Transition ** *** ** to *** **** ************." "*** ******* **** ****** are **** ******* ******** that *****'* *** ** modern ********, ******** ****** ports, ***." "****** **** ********** ********* systems." Internal costs are also an issue. Like many integrators, we do both cameras and access control. And the material costs would vary greatly. the camera project might cost the integrator $1500 (8-10 $100 cameras, $400 NVR, Cable) but the access project would cost double that. So the 10k access control job has double the labor costs and double the materials of the camera job? I thought margins for AC were higher than video.